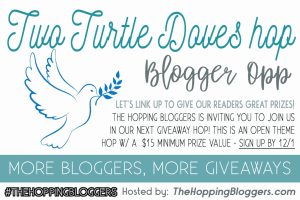 Thank you for your interest in the “Two Turtle Doves” Giveaway Hop. You will need to be sure to report your link on or before December 4th at 11:59 am EST to ensure your spot on the linkup. Any late links and links with issues will be moved to the bottom of the linky when we go live, and then removed after 24 hours if not fixed. Your giveaway post must be live by 12:01 am EST on December 7th, 2017 or you risk removal from the hop linkup.